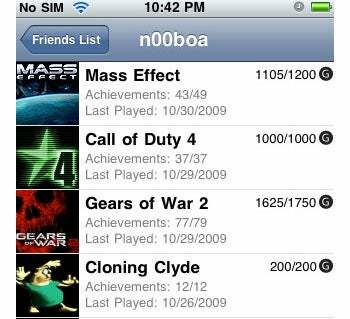 Can't get enough Xbox LIVE out of your Xbox 360? Apple iPhone owner? Two bucks to spare? You might care to give 360 Live a look. It's a smallish 1.6MB app available through Apple's iPhone store designed to let you reach out and touch your Xbox LIVE account from just about anywhere, as well as several of the service's tracking and messaging features. Accordingly, you can manage your Gamertag as you would in front of the actual box, adding, removing, accepting, or rejecting friend requests. You can see who's online or not, check 'gamerscores' (a numeric tally of lifetime game achievements), biographical info, avatars, locations, and so on. It's possible to keep tabs on friends' game histories and compare achievements in general or by game, and if you're into text chatting through LIVE as opposed to standard messaging tools, you can read and send your LIVE messages--even dispatch to multiple recipients at once. This isn't the first version of the app, but it is the first that lets you login with your Xbox LIVE credentials and automatically grab friends without having to enter them individually. Customer reviews seem predominantly positive, with 20 of 35 awarding the app five stars. The handful of low ratings complain of slow logins or the rare crash, and one preaches about the dangers of handing over your Xbox LIVE access information to an independent developer. The question is whether Microsoft will let that $2 fee stand, since the company declared back in August 2008 that all Xbox LIVE-related apps had to be free. Stories at the time claimed Microsoft has "halted" sales of all LIVE-related iPhone apps, which is slightly misleading, since all Microsoft can technically do is appeal that Apple do so. 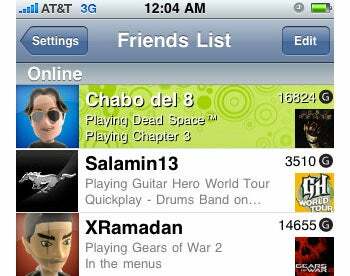 Whatever actually happened back in August 2008, developers apparently complied, and popular apps like Xbox LIVE Friends dropped to gratis status thereafter. Should Microsoft be able to dictate the terms of sale when it comes to independent manipulation of what amounts to the exoskeleton of its LIVE services? To the extent end user license agreements can be promulgated and legally enforced, the answer's yes, the operative word in that sentence being 'extent'. Given precedent, I'd wager we'll see the app drop to freebie status soon.